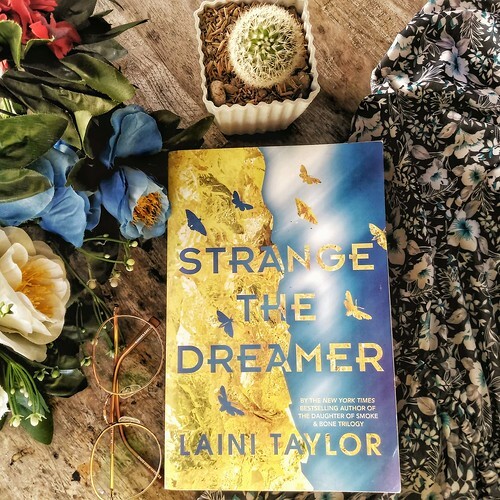 Hello, how do we even start reviewing Strange The Dreamer? First off, I’ve been eyeing this book for forever. It’s the kind of book that slowly draws you in, see. So it starts with the title: quite intriguing. Then the cover: gorgeous. Then the blurb on the back: oooh, exciting. I lovingly stroked this book’s spines for a good couple of weeks before I finally had the guts (and budget) (and enough weird looks from the sales ladies) to buy it. What I wasn’t counting on was Laini Taylor’s writing. My goodness, that woman just kind of blows everyone out of the water! I haven’t read anyone with prose as lyrical— and dare I say— dreamy as hers. She literally weaves worlds out of words and the sheer beauty of it kind of took me by surprise. First: the names. I love characters and settings with wonderful, memorable names. When I was younger, I read a Reader’s Digest feature on JK Rowling when she was just starting out. The article said that Ms Rowling had a wonderful way with names. And I think this is the case for Ms Taylor as well. I loved Lazlo Strange’s name. It was, well, strange. I love how the desert’s name, Elmuthaleth, falls from the tongue. I love the title “godslayer”. I love the ring of Thyon Nero’s name. They all just seemed so…fitting. Next: the overall storytelling and world-building. I guess Ms Taylor just has a knack for the insanely out of this world. I mean, the prologue was about a blue-skinned girl falling from the sky. It’s insane! I love how the characters stood out against such a fantastical backdrop. It was like looking at an award-winning Nat Geo photograph, you know? It’s all so beautifully composed, everything was well-balanced and the characters were so fleshed out, you wanted to root for all of them, even the villains. I truly enjoyed the characters’ inner conflict and turmoil and how their actions affected one another. I read some reviews that found the storytelling and pacing dragging at times, but I didn’t share the same sentiments. I loved how the author took her time playing with words and shaping the characters and worlds and events with them. If anything, it made me more engrossed and invested in the story. Perhaps the only drawback that I could think of was the love part. I had a feeling similar to when I was reading Our Dark Duet. After all that build up, the two main characters’ actual relationship didn’t seem to live up to the tension preceding it. I’m not sure why I feel that way. There were some aspects of it that kind of felt insta-love-ish, even when it wasn’t. Perhaps it was all that making out— so pedestrian against the lush narration, LOL, TBH— IDK. Hahaha. But there was something off about it. There’s a Filipino word called “kilig” which doesn’t have an English equivalent. It refers to that tingly feeling you get when exposed to something cute and sweet, etc. Very little kilig ensued between the two MCs towards the end. I definitely felt kilig when they were just kind of discovering each other, but when they were finally together it sort of fizzled out. Maybe it’s just me, I don’t know. Nonetheless, Strange The Dreamer is probably the best book I’ve read this past year. I can’t wait to get my hands on the sequel, Muse of Nightmares! This one’s a solid 4.5 for me! Don’t have your own copy of Strange The Dreamer? Order one from Book Depository here! They offer FREE shipping worldwide! Glad you loved it. I’m excited for Muse of Nightmares too! How did I miss this comment? I’m almost finished with Muse of Nightmares now. Wow, what a ride!